Though Maximum Games CEO Christina Seelye aims for her company's success, she's not the kind of person who's overeager to get to the finish line. For her, enjoyment is found in growing new businesses. This year, Seelye gets to find that enjoyment without having to let go of her previous successful venture. After a soft launch last year, Maximum Games is debuting a brand new publishing label: Modus Games. Seelye's background before Maximum wasn't in gaming specifically, but she's always been involved in tech. All of Seelye's ventures so far have been some variation on distributing or selling consumer technology products through various channels. Maximum Games is the third company she's founded. "I hate saying the word 'serial entrepreneur'," she jokes, "but basically I can't work for other people. I have to do it myself." Maximum Games wasn't founded out of a deliberate desire to get into gaming, but rather out of what Seelye saw as an industry niche she was able to fill. After selling her previous organization to a French public company and making a lot of European connections as a result, Seelye noticed there was a wealth of video game content across Europe that hadn't made it to North and South America -- mostly Nintendo content. In 2010, Maximum Games was born, and began bringing already-released content in Europe overseas. Nearly ten years in, Maximum Games has published over 30 titles and is not only one of the top 20 video game publishers in the US and the UK (per the NPD), but also the only one to have effectively bootstrapped itself into its position. "It was not that we started out going, 'Oh, we're going to become a top 20 video game publisher,'" Seelye says. "I would love to take credit for the grand strategy, but it was really born out of a need for good distribution that understood the US market here for people who weren't necessarily in the US. There were a few companies doing that at the time, but we did it really well, and so the company continued to grow." "[Maximum was] born out of a need for good distribution that understood the US market here for people who weren't necessarily in the US"
Now in the wake of Maximum's success comes Modus Games. Modus published a handful of titles last year in what Seelye refers to as the label's 'soft launch.' 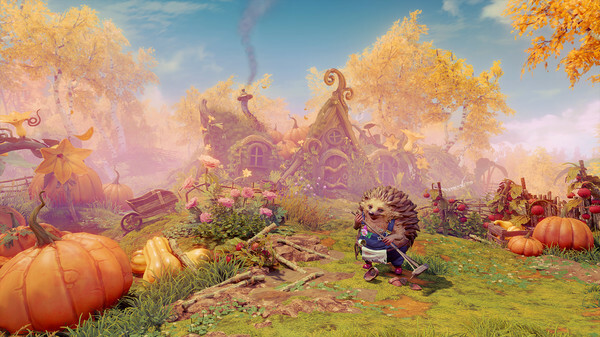 Now, she says, it's ready to make a proper debut later this year by publishing Trine 4 in partnership with developer Frozenbyte. Modus isn't just an offshoot of what Maximum is already doing, though. Seelye says the main difference between the two publishing labels is that while Maximum is focused on bridging the gaps between international markets with publshing and distribution, Modus will publish new games for the first time from up and coming independent studios. "With the same concept [that led to Maximum Games' existence] of identifying a need and filling it, what we realized is that there were a lot of indie studios that were having a hard time figuring out what is the right publisher for them," she says. "That's a really broad issue, because indies have these choices now of being self-published. They could theoretically do it themselves at Xbox, PlayStation, Steam through Early Access, or other places. Or they could go to a larger publisher. But most independent studios were not going to get the support and dedicated team and love that they need from one of the big AAA publishers. "What we found was there was a huge amount of really, really solid, interesting content that was having a hard time making its way to market effectively because self-publishing wasn't really working. They didn't have the skillset inside the studio to manage that, and their game wasn't going to reach the kind of sales where a big publisher was going to pay attention to it. We found a niche and feel like there's a huge opportunity for independent studios such as Modus." Seelye says Modus sees itself as the 'developer's publisher,' making developer retention of creative control a high priority while focusing on providing the "blocking and tackling and strategy and execution" to help indie studios navigate the complexities of publishing and marketing across numerous different platforms and distribution channels. "It's really hard for an independent studio to publish on their own to maybe three platforms, let alone what we're seeing now," Seelye says. "You're going to have a Discord store and an Epic store and a cloud and a Steam store and all these other places...It's not just going to Steam or Xbox anymore. There are so many different channels to leverage and so many different components to how we have to market today. They call it the golden age of television right now because there are so many different pieces of unique television content. But it's really the golden age of indie games as well. There's so much coming to market that it serves the independent studio well to work with a publisher that's going to help raise it above the waves." Seelye says that the backing and financial support of Maximum is one major key to making Modus stand out. Because of Maximum's backing, Modus can bring independent titles to global launches both physically and digitally, something that few other indie publishers can manage. "Whatever you say about the growth of digital and the death of physical, physical is still a place where people are buying a lot of games, especially in certain territories. You leave a lot on the table when you go with an indie publisher doing digital-only and maybe partnering with a few people for physical here and there." "You leave a lot on the table when you go with an indie publisher doing digital-only"
That doesn't mean every game Modus releases will have a global, digital, and physical launch. Sometimes, Seelye says, it just doesn't make sense, though she foresees a shift in game price points in the coming years that may change what's viable. "If you have a three-hour game that's only going to be $19.99 or $14.99 you can't launch that game physically, because the cost structure of a physical good is going to throw it way out of whack," she says. "But we've done really well even as low as $30. We can launch that physically. "We think it's really important to establish this independent studio price point. The game might not have all the CG slick cutscenes of a $60 game but still have hours and hours of compelling gameplay and a really cool mechanic, but we're okay with that game being $30. I think pricing is going to be something we're going to pay a lot of attention to." Having enjoyed ten years of success with Maximum Games, Seelye hopes to continue that strength while involving Modus in that growth. In both cases, Seelye says the company's success is tightly intertwined with the success of its partners. "I never anticipated Maximum having the demand for its publishing services that it has. It's been a year over year over year improvement. The reason why Maximum is really growing and has continued to grow is because we've done a great job with our partners, which has allowed them to grow. I'm not trying to be cheesy, but it's a nice way to work. Our success really leads to their success, and their success leads to more games for them, and we're doing that for all our partners, so all these partners now have more games that we then get to bring to market."